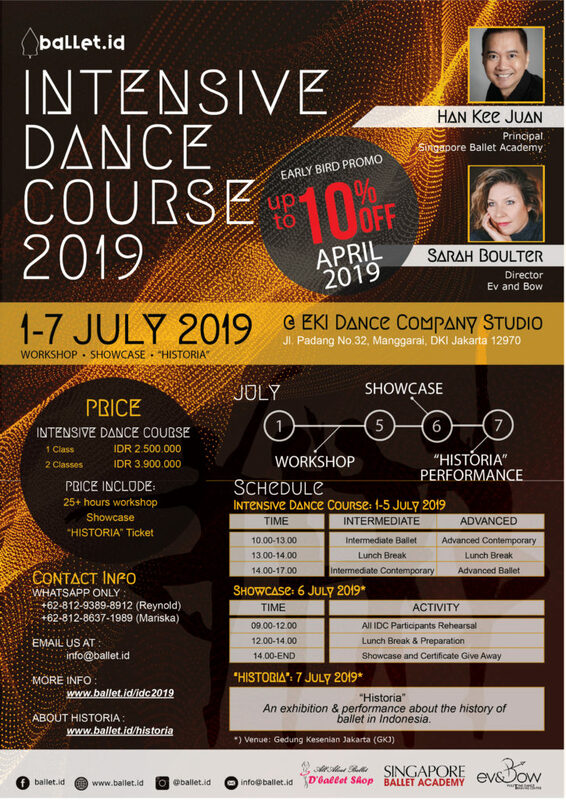 Ready to grand jete-ing your way to Intensive Dance Course 2019? 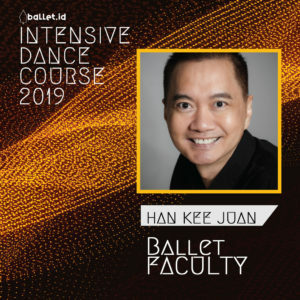 This year, Ballet.id's Intensive Dance Course will give you a rare and ah-ma-zing opportunity to learn directly from the best faculty of the Singapore & Australia dance scene! Not only that, we also welcome the Asian Grand Prix 2019 Regional Jakarta Scholarship Grantee to join our IDC2019! Our one full week / 30+ hours intensive course will give you a lot experiences not only in dance, but also you can mingle and have fun with new friends! On the 6th day you will showcase your new skills and moves in Gedung Kesenian Jakarta. To end the course you will watch the performance by Indonesian Dancers and West Australian Ballet Dancers. Secure your spot right away!! for more info about Class level, refer to IDC FAQ page here. Upon completion, all participants will receive a certificate. Oh, for your own optimal learning experience & convenience, we can only accept limited number of dancers in each class. So sign up right away to book your spot!! (All participants will be accepted on a first come, first served basis upon payment). - Early Bird price is available for all IDC classes. Early Bird discount only applicable for payment UNTIL end of April 2019, regardless the registration date. and 1 (one) Regular Historia Ticket. Han Kee Juan is currently the Principal of Singapore Ballet Academy. He has trained and coached many dancers. Some are principals and soloists of prominent companies in USA and Singapore, namely, American Ballet Theater, Boston Ballet, Houston Ballet, San Francisco Ballet, Pennsylvania Ballet and Singapore Dance Theatre. His most accoladed student is David Hallberg, Principal of Bolshoi Ballet and American Ballet Theatre. Mr Han is a master teacher and has been awarded 5 prestigious teaching awards. He previously directed Arizona Ballet School, The Washington School of Ballet and was a faculty member of the prestigious North Carolina School of the Arts. His dance career began in his native Singapore, where he began his training at age ten with Florrie Sinclair and then with Goh Soo Khim. Upon graduation from the Australian Ballet School, he was invited to dance with the Sydney Dance Company, then the Goh Ballet in Canada, where he was also trained by Lin Yee Goh to teach the Russian method. Additionally, he was Principal Dancer with the Indianapolis Ballet Theatre and was a Soloist with the Boston Ballet. He danced most of the principal roles in the classical repertoire, as well as the ballets by Balanchine and modern works by Jose Limon, Mark Morris, Ralph Lemon, Susan Marshall and Bebe Miller. Mr. Han’s international teaching includes guest teaching at the Singapore Dance Theatre, Edmonton Ballet Academy, Sydney Dance Company, Ballet Austin, Atlanta Ballet, Boston Ballet, Hubbard Street Dance Company, Vail International Summer of Dance festival, Jacob’s Pillow, Milwaukee Ballet, Los Angeles Ballet Academy and the renowned Jackson International Ballet Summer School. Mr. Han was the recipient of The Excellence in Teaching Award at UNCSA. He was also the co-founder of the American Ballet Competition and was also featured in the Singapore Encyclopedia. He was also named the best teacher/coach at the Youth America Grand Prix in 2000 and in 2015. He was awarded the 2008 Dance Teacher Award for best teacher of the year. Under his Directorship, The Washington School of Ballet was awarded the Best Youth Dance Performance by Washington DC/Metro Dance. The School was also awarded the Outstanding School Award at the Youth America Grand Prix each year in the 6 years of competing. He was on the cover of Dance Teacher Magazine in 2014 with his student David Hallberg and was featured as the Teacher of Men. He has coached many prizewinners in numerous international ballet competitions. He also implemented the Teaching Syllabus for Washington School of Ballet during his tenure and has guided many teachers with their teaching. After a successful international career Sarah has returned to Australia to continue developing her choreography. As a dancer Sarah was often employed due to her choreographic talent and has worked with well-known choreographers and directors in a collaborative manner. Credits Include "Enter The Vortex" by the Dream Dance Company, "Dance Academy the Come Back",The Opening Ceremony of the Arab Games (David Atkins Enterprises), SYTYCD UK and Australian season 1,2,3 & 4, Dance Academy ABC3, The Voice for Jennifer Hudson, Dance Boss & Puberty Blues. Meryl Tankard’s “Kiadan saw Sarah display her choreographic ingenuity, while creating alongside this world-renowned choreographer as well as a team of Tiakoz drummers..
Sarah spent two years living in Las Vegas, where she had the amazing opportunity of working in the Celine Dion show A New Day, working with great names such as Mia Michaels and Franco Dragone..
As well as performing and creating Sarah finds passion in teaching. 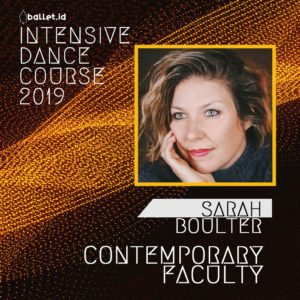 She has taught all around the world receiving much acclaim., Sarah is sought after for her contemporary works & find’s great pleasure in sharing her Knowledge to up & coming Dancers. Mayor international congress awards representing Sydney Dance Company. Since the ‘90s, an increasing number of students from the Academy have been accepted into prestigious professional dance schools overseas, including the Australian Ballet School, New Zealand School of Dance, Hong Kong Academy for Performing Arts, Boston Conservatory, Rambert School of Ballet and Contemporary Dance, English National Ballet School and Central School of Ballet. Over the years, it has been richly rewarding to see many SBA alumni as prominent professionals in the performing and pedagogical dance fields in Singapore and the international dance scene. Ev & Bow is a Full-Time Dance Training Centre that offers quality training to students seeking a career in the dance, entertainment industry. It has a classical/contemporary focus as well offering performing arts options. Under the direction of Sarah Boulter and Lisa Bowmer, Ev & Bow has a reputation of supreme quality. It is the premiere studio for innovation, passion and outstanding results. Ev & Bow is leading the way in the dance Industry with cutting edge choreography and professionalism. Ev & Bow selects exceptional dancers into a nurturing environment providing personal care and boasting limited class sizes. It is Ev & Bow’s mission to provide quality training to enable the dancer to be a versatile and valuable member of the dance industry. To broaden their knowledge, creativity and respect for their craft. Ev & Bow focuses on technical brilliance and is recognised for producing dancers of a high technical ability across all areas of the practice. Our dancers are well known for their athleticism, virtuosity and technical efficiency. Ev & Bow fosters not only a dancer but also an artist and nurtures each student to be unique, creative and individual. We encourage our dancers to continue to investigate their individual strengths and then work with them towards the career option that best suits them. Ev & Bow has formed valuable relationships with many dance companies, industry professionals and tertiary institutes both nationally and internationally. The result of this being a vast opportunity for work opportunity that becomes evident from the minute you step foot into Ev & Bow. Ev & Bow dancers will be given work and secondment opportunities throughout their year of training. We currently have strong relationships within the Australian Dance Company community as a result of some of our dancers working successfully with Australian Dance Theatre (currently three), Shaun Parker Dancers, Mod Dance, Australian Opera and Meryl Tankard.